Address and directions will be posted here on the forum soon. 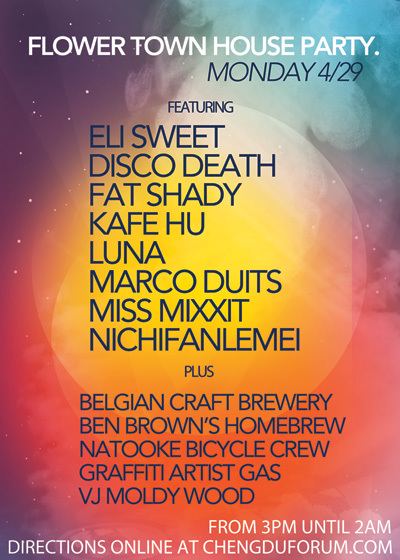 There actually wasn’t enough room on the flyer to list everything that will be there. We will be making pizzas and barbecue in addition to the stuff listed there. To anyone who went to the party at Morning last weekend in Sanshengxiang, this house is a 5 minute walk from there, with inside and outside areas. We got frisbees, badminton, and beer pong, too. Address: ???????????? ?154?, very near Morning Bar in Flower Town. There’s a black gate at the house and you will hear music. Oh I thought it was a “house” party (genre), but it’s an actual house? Isn’t it going to be too small for the entire laowai Zebra visiting community? The poster makes it look as if this is going to be the replacement event, haha. It’s only for Lao wai or anyone (e.g. Chinese ) can join in? Go to the place with bikes and Natooke? House party in a straight up house… what!! We’ve been waiting so long. All kinds of music! Laowai only!! Completely kidding. Please come, and bring all of your friends. The party is free and open to anyone. Go to the place with bikes and Natooke ? Yeah, there will probably be a group ride out there on Monday, leaving from the Natooke shop. House party in a straight up house… what!! Is this place ebike friendly? Poss ride my bike there. When can we expect to see directions? Need to google map it to see how far it is. Yeah man. Additionally, we have room for like 15-20 people to sleep at the house if you need a place to stay. Not individual rooms but cushions, etc. Bring a sleeping bag or a sheet and you can crash at the house. Or be fancy and bring a tent, there’s room for that too. Soon. 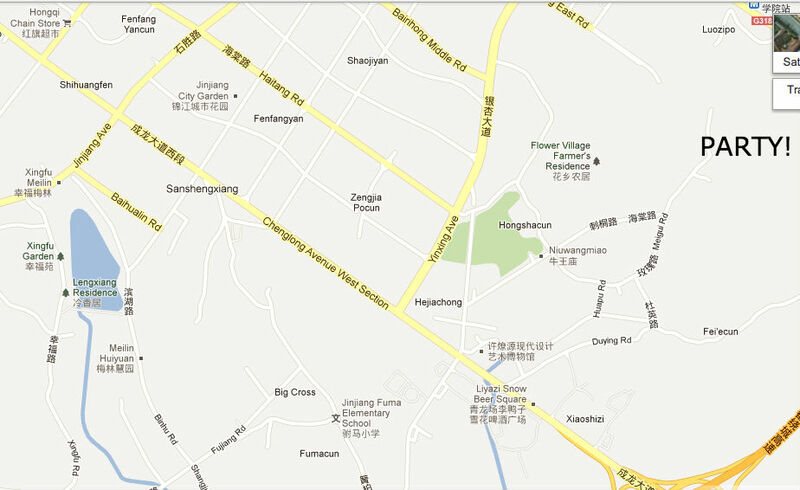 It’s in Sanshengxiang (三圣乡) so if you Google that you’ll have a good idea of how far it is. By bicycle it’s about 35 minutes, by taxi it’s about 20 mins. Home brewed beer (Belgian and American) will be available and cheap, and the event itself is free, so your taxi or transportation costs will be offset by that. Ok time to google that place. Know the distance from the last train stop on line 2? That stops at Longquan. The house is a 15 minute walk from one of the stops on Line 2. I’m not sure which one, but I’ll find out and post that info here along with the address and directions soon. This is what i got when i mapped it. Hope this is correct, really close to me… Ill say about 5-10 min ebike ride. LETS DO THIS!! Jerry, your location is slightly off. If anyone is confused about the exact location, THIS(Giant Image) is a little more accurate. I can’t get that address to show up on Google or Baidu, maybe you could post a link?